The City of Port Alberni is a vibrant community that places a high importance on recreation and active living. The City has developed an Active Transportation Plan to guide long-term investments to improve the overall network, including cycling lanes, new multi-use trails, expansions to the sidewalk network, and other facility improvements. We are also working with the community and various partners to provide education about how to share the road safely, how to ride safely, and how to prevent collisions. The City has over 18km of developed trails that provide cross-town connections through some of Port Alberni's most beautiful natural areas. A map of the City's developed trail network is provided on our website with descriptions and other helpful information. With the assistance of a $50,000 Bike BC grant, the City has installed a series of bike lanes along major routes within the City. Bike lanes are dedicated road space for cyclists adjacent to motorized traffic. They are separated by a painted dividing line and identified by signs and pavement markings. 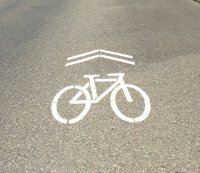 The pavement markings include a diamond (to indicate restricted use) and a bike symbol (to indicate it’s reserved for bicycles). Sharrow markings are placed along certain lanes to indicate the road is shared by motorists and cyclists. Lane widths vary and it cannot be assumed that the lane can be shared by a motorist and a cyclist, requiring the motorist to provide a safe distance when passing. Sharrows are indicated by painted road markings consisting of a double arrow and a bicycle stencil. Note: Cyclists should take special caution, as sharrows do not provide any protection beyond communicating to all road users that it is shared space. If a bike lane exists, ride in the bike lane in the direction of the flow of traffic. If no bike lane exists, ride about 1 meter away from parked vehicles. This helps avoid getting hit by an opening door. Use extra caution if you notice people in vehicles, taxis or buses. Shoulder check well in advance and hand signal before turning. Remember, drivers sometimes fail to yield the right-of-way and won’t always see you. Try to be predictable in your actions to increase visibility. Follow the rules of the road. 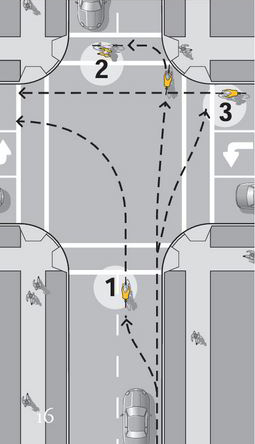 Cycle in a straight line with the flow of traffic and position yourself where drivers can see you. Avoid their blind spots and treat every driveway like an intersection. Remember safety equipment. Wear a helmet (that meets safety standards CSA, ANSI, ASTM, or SNELL B-95) at all times and use good, visible bike lights on the front and rear of your bicycle. Consider using a bike bell to warn pedestrians and other road users of your presence. Shoulder check and watch for cyclists. Be especially vigilant when approaching an intersection or when turning. Cyclists don’t always stay on the right. Stay in the vehicle lane and keep a safe distance. Do not drive in the bicycle lane. If you have to cross the bicycle lane to enter a driveway or turn, shoulder check and watch for cyclists before moving out of the vehicle lane. Leave at least 3 seconds behind cyclists and at least 1 meter when passing. Signal early. Signal at least 30 meters in advance of making a turn to alert other road users of your intended action. Bike straight across the street, turn the bike and position to go across the other way. On a crosswalk or sidewalk, a cyclist must walk unless signage specifically indicates something else. At traffic signals, cyclist positioning may depend on the traffic sensors. Be cautious, as nearly 80% of bike accidents occur at intersections.